I know this dish probably doesn't look that appetizing but you have trust me on this one. 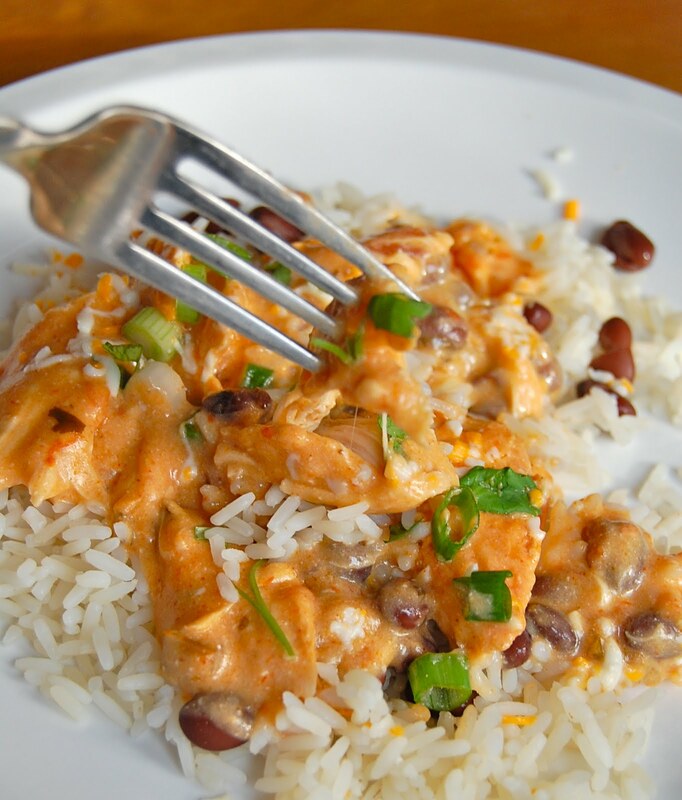 In fact, I think you should bookmark this page if you like the following: chicken, Mexican flavors and your slow-cooker. 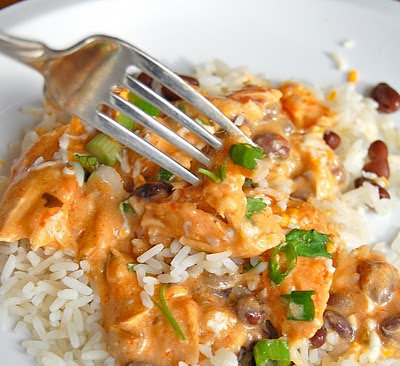 This is the very popular (at least in the food blog world) SALSA CHICKEN! Who knew chicken breasts + can of cream of chicken soup+ taco seasonings + sour cream could be so good. I know I sure didn't. I had seen this recipe so many times but it just did not sound that appealing. Of course, everyone raved about it, hence it's popularity. Well, I'm so glad I tried it too b/c it really is so tasty....and easy!! If you have already made this dish, please feel free to leave your review below. THANKS! My version is a little different, but its a staple in our house. Such a great, easy meal! The dish looks so delicious. I would like to make it tonight. I have bought a new slow cooker yesterday only and want to use it for making this dish. This is my kind of dinner! Simple yet delicious! My mom use to make this all the time for us. I love it! This is by far one of my husbands favorite recipes! I'm usually not a fan of crockpot chicken because of the texture, but since this such an Internet hit, I decided to give it a try. I am so happy I did! Not only did the texture turn out well, but it was tasty! Thank you for the recipe! I have it cooking now while I'm here at work, can't wait to come home to a cooked meal. Hungry thinking about it. Thanks for the recipe! Holy Salsa! I am making this tomorrow night - would have been tonight but I already have the pasta sauce brewing. YUM! Sounds yum! This is going on tomorrow nights tea menu for sure! Do you put the chicken breasts in the slow cooker frozen or thawed? Can't wait to try this recipe! I used thawed chicken but I'm sure frozen would work also. You might just need to let it cook for an additional hour or so. Frozen meat in a slow cooker is not really a good idea. Why? Because as it thaws, it spends a good deal of time at an unsafe temperature. I put frozen meat in my crockpot ALL the time. It's not an unsafe temperature, because you're just cooking it from frozen. Yes, but it is being cooked from frozen at a much slower rate than in the oven. The slow cooker gives the bacteria too much time to grow, and all of that juice is then soaked up into the other items in the pot. ...And is then heated to a higher temperature, which would kill whatever bacteria you're referring to. Its science. Hmm... by that logic, you should be able to eat spoiled meat because it "kills whatever bacteria" you are referring to. Science suggests eating meat that has the opportunity to grow harmful bacteria should be discarded. I agree with the original post. Frozen meat in the slow cooker spends too much time at an unsafe temperature. Many slow cooker cookbooks have addressed this and have determined it is safe. It's not at an unsafe temperature for long enough. is there any sub for the cream of chicken soup? sorry...it kind grosses me out for some reason, haha. check online. There are all sorts of homemade versions that taste WAY better than the stuff in a can. And they come together in about 5 min. I do a similar recipe all the time without the soup or sourcream, I use the salsa, taco seasoning, cilantro, some lime juice and always add a can (or two) of whole black beans (rinsed) and it comes out amazing without all those extra calories. As an additional tip, I only use salsa casera Herdez because I don't like the taste of others. I don't like any creamed canned soup. I make a white sauce and use it instead. I hear'ya! Just google "cream of chicken soup sub" and you will find a homemade version. Is the chicken supposed to be precooked or do you put it in raw? Use raw chicken. It will cook for 6hrs. I used frozen chicken and took it all out and shredded the chicken after about 6 hours on low. Shredding it allowed the chicken to really soak up the sauce. I didn't even remember to put the taco seasoning in until after I shredded the meat and it was still really good. Thanks for sharing this. When should I shred the chicken? After the six hours are up?? This might be a stupid question, but what size can of soup are you supposed to use for this recipe? Yes, shred after 6 hrs. Then put back into the slowcooker. Just a regular 10 3/4 ounce can. Can I cook this on high? I don't have 6 hours. Just made this today and it's so delicious! Thanks for posting. Delicious!!! There aren't many meals that I just love, but this was awesome. I made it just as you make yours with the beans cheese and cilantro, omitting onions. Very easy to make. I doubled it and it worked out great! Thank you for sharing. It's definitely one we'll be making again. We are making this one right now! Did you put the beans into the crock pot as well? If so, at what point? Could I make it with Cream of broccoli?? You can put the beans in during the last 15-30 minutes. Hmmm, no I would not sub in cream of broccoli. How many chicken breasts did you put in? I think I put in like 2 large chicken breasts. This was delicious. I doubled it and added in a can of black beans and some corn. Thanks for sharing! Hmmm...cream of broccoli or asparagus DOES sound pretty good though. None of the taco seasonings, but put in some other seasonings or fresh herbs, maybe serving over stuffing? Yummmm! You can add a can of rinsed black beans when you start the meal, won't hurt and the beans will soak in all the yummy juices and make them so delicious! I also add in a can of (rinsed) chopped jalepenos! I just want to thank you for this delicious recipe! I made this for the first time last night and we absolutely LOVED it! I too added the beans and cheese, and I used the taco seasoning recipe and it came out so good. This recipe will be used again and again. Thanks Margie! Glad you enjoyed it!! I'm out of taco seasoning. Yikes any suggestions?? I would really appreciate it. Little late to run to the store. I have a recipe for homemade taco seasoning in the post. Try that....you probably have all the spices you need on hand. If not, use a combo of chili powder, garlic and cumin...or what always works for me...borrow some from a neighbor. Ty I just noticed that as soon as I wrote it and I had all the spices so I excitedly mixed them up and it even smells better than the actual seasoning packets. So thanks you are wonderful! I'm trying really hard to be a better knowledgable cook for my kids and family. No problem...hope you enjoy it! Also, I found it on pinterest! I am actually going to use Fage plain greek yogurt instead of sour cream and see how that turns out! Do you always serve it over rice? I'm a horrible rice-cooker :-) I need to serve 15 ladies (using 2 crock pots) and this recipe looks perfect!! No, you don't have to serve it over rice. Try serving it in taco shells (soft or crunchy) and have lettuce, sour cream and pico de gallo for toppings. BTW, I'm terrible at cooking regular long grain rice but LOVE Jasmin rice. Give that one a try....you might like it better too. This is really yummy! I found in on pinterest two weeks ago and I'm making it for the second time tonight! Also, your taco seasoning recipe is delicious. I mixed up a bunch and put it in a little container for the next time I need some. Thanks for sharing! Am making this tonight for my family. Have been loooking for some new recipes to add to our menus. Will let you know what the boys think. Thanks for the feedback and congrats to your upcoming bundle of joy! The slow-cooker wild rice and chicken soup is another very popular recipe that I have posted. I recently posted a slow-cooker chicken and mushroom recipe and have another to share too. I liked both a lot! Sounds delicious!!!! At what point do you add the sour cream??? About 15 minutes before it's done. YUMMY! Found this on Pinetrest and had to try it. Made it for supper tonight and it was fantastic! Thanks for the wonderful new meal! Sounds like it's worth a try....just adjust the time. Let us know how it turns out. Do I need to cook the chicken any before I put it in the crockpot? Also, does this freeze well? Thanks for the feedback! No, the chicken cooks in the slow-cooker for 6 hours....it'll be perfect. I don't know how this would freeze...I probably wouldn't. TOTAL YUM!! IT'S OVER 100 (40C) DOWN HERE IN AUSTRALIA SO STUCK IN THE HOUSE WITH THE AC RUNNING FULL BLAST! I HAD THREE CHICKEN BREASTS, CREAM OF CHICKEN SOUP AND ADDED SLICED AVOCADO AND LIME JUICE WHEN SERVING. FORGOT THE CHEESE BUT DIDN'T MISS IT! SHARING THIS RECIPE WITH ANYONE WHO WILL LISTEN! THANKS! I made this yesterday, and it was fantastic! this recipe is in my crockpot right now and it smells CRAZY GOOD in my house!!! Thank you! Do you think I could sub low-fat or fat-free sour cream and low-fat cream of chicken soup? So good! My family loved it! Thank you for the recipe. Made this last night for dinner and it was SO yummy. Even my picky 4 year old liked it. Anyone happen to know the nutrition facts for this meal? Do you serve it over rice? yes, but you can serve it anyway you like. Works great as chicken tacos. Followed the recipe and served it over rice...GREAT Mexican chicken dish...tasty and easy! Found it on Pinterest. I love this recipe! I doubled it for me and my husband the second time I made it because we both wanted seconds the first time and there was not enough for both of us! But I was short 1 can of cream of mushroom and had to go to work, so I just added 1/2 cup milk and it turned out fine! So, I asked about using turkey breast before...we ended up using the turkey for something else, because my husband thought turkey and salsa sounded disgusting, understandably. We made this recipe finally tonight (with chicken!) and it was awesome! This is the 2nd meal he's said he'd make again, so I think it was a success. Just make sure you actually use all of the taco seasoning it calls for - I used a little less, and it wasn't as flavorful as I would have liked it, but still great anyway! Just put this in the crock pot. Can't wait to eat it tonight!!! Saw the recipe last night and made it tonight. This looks delicious! Thanks for sharing! What kind of salsa did you use? I don't remember what the exact brand I used, it varies. Just try your favorite jarred variety....it will be great! Jumping on the salsa chicken bandwagon... Sean made it for dinner last night and we both thought it was great. Thanks for the recipe! I'm making this now! Can't wait! Should I put the whole packet of taco seasoning in or just 1 tbsp? I'm not sure how many Tbsp. are in a packet of taco seasoning. I used homemade taco seasoning. It really is up to you though...my kids don't like super spicy food so I keep mine on the mild side. Let me know how it turns out. I just measured a McCormick packet of taco seasoning. There are roughly 5 1/2 Tbsp of seasoning in there. I'm doubling the recipe but think I'll stick with one packet. Wish me luck. My husband gets heart burn really easily and although he liked the taste as we were eating - it killed him later. I think it was the salsa...or maybe the taco seasoning. Any suggestions for some other alternatives? Can I make this without sour cream???? I don't have any but would love to make it--I have all the other ingredients. I make mine pretty mild b/c of the kids. I would suggest using a mild salsa and going easy on the taco seasoning for next time. The sour cream makes i nice and creamy but that salsa is what gives it it's flavor. I've never made it without sour cream but think it's worth a try. I made this today and tasted it with tortilla chips before I was ready to serve. Everyone started eating it as a dip with the chips - it was really good. My husband suggested adding corn next time! Thanks for the recipe - it was a big hit! ...and will use greek yogurt instead of the sour cream. Also, I will up the spice, since the sour cream/greek yogurt plus the rice we put it on, really dulls the heat. Thanks again, love it! A friend of mine suggested this to me and it was a hit at our house. So super easy I am making it again for a potluck supper tomorrow at church. Thanks! How many does this serve? I need to feed 8 people and I have a large crock pot. Can I put it in on high for 3 hours?? Delicious as a tortilla chip dip! I put about 4 lbs of chicken breasts in a large crock-pot and quadrupled the soup and salsa. I also used two packets of taco seasoning. Do you think this will turn out too runny? They were still a bit frozen too so I set my crock-pot on high for 6 hours. Thanks for your input. I made this a couple weeks ago after picking it up on Pinterest. I sort of forgot to put the cream of chicken soup in, but honestly it tasted awesome without it! i used it as a taco filler so it worked out. I think you might need it if you use it on top of rice though. Excellent recipe for the mom on the go! Made last night and was not at all impressed. I felt it was very bland considering the amount of seasoning there is. Would make again but with different seasonings. I used a homemade cream of chicken soup recipe with chicken broth, milk, and spices. Substituted plain greek yogurt for the sour cream. And I wanted it to be a one-dish meal so I added veggies as well: black beans (not a veggie, I know! ), corn, red pepper, finely diced carrots, and chopped spinach. Everything melds together and soaks up the flavors. Stirred in more taco seasoning and salsa right before adding the yogurt to brighten the flavor. Will have the leftovers with tortillas tomorrow. Yum! Would this be ok over mashed potatoes? I have it cooking now but just realized I'm out of rice!! Sure! I don't associate Mexican foods with mashed potatoes but I don't see why not otherwise. Enjoy! So I made this recipe and it was super delicious! My girls loved it and I can't believe how easy it was to make. I used your taco seasoning recipe and that is so much more tastier than the package seasonings. how many servings does this make? i am excited to try this recipe. About 4-6 servings. This is an easy recipe to increase. Will it mess up the recipe if the sour cream was added with all the other ingredients at the beginning of cooking it? Hi, I just found your weblog via google free cooking games. Your viewpoint is truly pertinent to my life at this moment, and Ia€?m really pleased I found your website Dora Games. I am goin to try today but am going to cube my chicken and see what happens. I fixed this tonight for dinner.......DELISH! Could I use cream cheese instead of the sour cream at the end just to give it some creaminess? Hmmm...it will mellow out some of the taco seasoning but I don't see why not. I'd add less cream cheese though than sour cream b/c of it's thickness. Let us know how it turns out! I used chaboni greek yogurt instead of sour cream and it was delic! Trying this tonight, looks yummy. Is it condensed cream of chicken soup you use? I have a tin on just normal 'non condensed cream of chicken soup. Yes, it's the condensed version...not sure if it would make a huge difference with the non-condensed kind. Thanks for the recipe. Found you on Pinterest. I just made this. I didn't have cream of anything soup (my husband actually eats them) so I used a can of creamed corn .... My sour cream had expired (I've been sick so things I thought I had) ... So I used cream cheese ...... Wish I had made a double batch !! There are no leftovers !!!! Tried this today and it was a hit. My skeptic of a husband for anything different, loved it and thought of different ways it could be served. Has anyone cooked this longer than 6 hrs? I work full time, so my slow cooker recipes need to be able to cook for a little over 8 hrs. Did everyone shred their chicken before adding the cheese or sour cream? I am trying this tonight. I may even add in a can of black beans. Sounds yummy. I can't wait to make this. With the extreme temps here, I love when I can make a hot dinner without having to use the stove/oven. I do have a question though, when do you add the black beans? Thanks for sharing!! Made this for dinner tonight. Omitted the sour cream, served over rice and black beans and topped with jack cheese and chunky quac. So good! Leftovers will be served wrapped in tortillas. I literally bought a crockpot today and made this. It's so delicious! I served it with bag boiled rice and chopped white onions. So good! This is the first time I've really cooked chicken well. haha Thanks for the recipe! I came across this recipe on Pinterest and finally got around to making it. Oh my goodness! Delicious! Found this on pinterest, i just started it in the crockpot n can't wait til.its done! I used cream of cheddar instead of cream of chicken, ill post results in a few hours! Just wondering if you add water with the cream of chicken soup? Or just the can of soup on it's own? Can't wait to try it! Just the can of soup...no water. This is the easiest meal I have ever made!!! It tastes so good!!!! Thank you for sharing :-) I will be making this all the time. This is the third time I'm making this and I always forget to comment. I found your recipe on pinterest this past summer. I use my slow-cooker for a minimum of 4 meals a week due to my DH and my work schedules. My husband is not a fan of most slow cooker meals because he says everything comes out wet, lol. He LOVES this and requests it every week. I am amazed and thrilled! I hate the slow cooker meals that require pre-cooking (seriously, f I had the time to precook, I'd have the time to make the whole meal!) so this one s terrific. When I add the sour cream, I cook the rice at the same time so dinner is ready pretty much when we walk through the door! My husband accidentally bought fat-free sour cream. Will that work instead of regular? I know sometimes it doesn't. This is the second time I've had this...it's cooking now. I tripled the recipe and am sharing with a neighbor who just had surgery. This time I added the black beans and Mexican corn. I substitute Greek yogurt for the sour cream(added protein! )I have four boys ages 17,16,10 and 9 and the all love it!I'm having a hard time not dipping into it early! How much salsa should be used with the recipe? Excited to try this tonight! This recipe calls for 1 cup of salsa. I have about an hour left on the cooking time, it hasn't thickened up at all, is this normal? Smells great by the way. Made this yesterday. However, I changed it up a bit. Did a can of Ro-tel, cream of chicken soup and taco seasoning with the chicken breasts. After shredding, I threw in a handful of brown rice about an hour or so removing from crockpot. Also added a can of black beans (rinsed and drained) to the mixture. Then I wasn't sure how to serve it, so, I made a lasagne sort of dish. Browned some flour tortillas, then put a little olive oil in bottom of glass pan, layered tortillias, mixture,cheddar/jack cheese, more tortillias, etc ending with cheese on top. Came out great. However,even though I only used 2 chicken breasts ( they were the large frozen kind), should have split it into 2 dishes and froze one. Being from Texas, I will probably add a little more 'spice' next time, but hubby loved it. Thanks for the feedback. I like your changes....YUM! Sound verry good plan on makeing it this week. This has turned into one of our go to meals. Love it. Thanks for the recipe! Love it! Making it for the second time. I like to use Cheddar cheese soup instead. Costs a bit more at our store, but we like it. :). (Sorry, didn't read all of the previous posts, so idk if anyone else shared this idea). HTH! I screwed up and put the sour cream in at the beginning just now, am I doomed? Aack! My guess is that it might be a little watery...please let us know how it turns out. Delicious! The whole family loved this. Husband has determined this must be put into the dinner rotation! when do you put in the sour cream? At the end, as per the recipe. Enjoy! As per directions in the recipe. I accidentally put the sour cream in with everything else!! Will it still turn out??? Totally freaking out! Aack! Might be a little watery??? Sorry...let us know how it turns out. I made this yesterday and it was delicious! I also accidentally put the sour cream in at the beginning with everything and it turned out just fine. I will definitely make this again! It was so easy and has so much flavor. We had this for dinner tonight and it was a huge hit! My parents were over for dinner and my dad said it was lick your plate good! We will be adding this to our dinner rotation! Thanks! did you put all the package taco seasoning ? I use homemade taco seasoning not the packet. Depends how much spice you like. My husband is not a fan of slow-cooked chicken, but he loved this! I also spiced things up a bit with cilantro-lime rice. Came across this recipe on Pinterest and it's amazing, I even made the homemade taco seasoning. So easy and so good. Thank you for sharing it. So I just made this and it is DELICIOUS! I added some things suggested in the comments. I added a can of rinsed black beans and some frozen corn right into the crock pot in the first step. I then added cream cheese for the last 30-40 min after I shredded the chicken. It is so creamy and delicious! We are having it over rice tonight, but will try it in tortillas tomorrow! Sorry if this is a duplicate - tried to post earlier and it didn't appear. I made this last night and it was so good - hubby raved! Maybe the best part was finding the homemade taco seasoning - delicious! I think I will throw the packet I have in the pantry into the garbage. I added a can of black beans and corn, as suggested by some others. I 'shredded' the chicken but not too small (thumb-sized). As I do with all recipes that call for sour cream or mayo, I substituted fat-free Greek yogurt for some of it (health, calorie reasons). Depending on the recipe, I can usually do half and half (if the recipe calls for a cup of sour cream, I do 1/2 cup of sour cream and 1/2 cup of yogurt). In some cases I do as much as 2/3 yogurt and 1/3 sour cream, some you can only get away with 1/3 yogurt and 2/3 sour cream before the recipe just "isn't the same". You have to start with a smaller proportion of yogurt and increase it each time you make the dish until you can tell when it is "enough" and you don't want to do more next time.This time I did 1/3 yogurt 2/3 sour cream and it was delicious. I'm confident that next time I can do half and half and it will be just as good. Also, with most Mexican "stew" types of dishes I serve crumbled blue corn chips or plain tortilla chips on top - I just like the texture / crunch. Thank you, this is a keeper for sure!